Let’s start with the basics of what I’m using this tent for. I go climbing – a lot. As a result, I end up camping – a lot. When I was younger and more naïve, I believed that lighter was always better, and that the best gear for all purposes was the pared-down, fast-and-light style. My last tent was in this vein and lasted about 10 years, but developed a few holes in the floor and some of the zippers warped from the tent being overly stretched out on the inside. Last season I decided to finally retire the 3-person, 3-season tent that had lasted me so long. Before hunting down the next-best-lightest shelter, though, I reevaluated what I was using the tent for. Very rarely would I go to a climbing area that required a long enough hike in to necessitate carrying the tent and equipment with me, and my car-camping set up has also grown considerably, so it was also really unlikely I’d be backpacking with a table and two-burner stove. Rather than cram into a smaller tent with myself, my girlfriend, our 60-lb dog, and an extra bag or two, the obvious shift was to move away from a lighter tent, and instead focus on finding a system that would lend itself well to my camping and climbing style. I figured what we really needed was a big tent – a little extra weight doesn’t matter when it’s either packed up in the car or being moved several yards to the campsite itself. Enter the Big Agnes Tensleep 6, possibly the smartest outdoor purchase I’ve made in years. First off, it’s huge – the floor area is about 90 square feet, and it stands a few inches short of 6 feet tall. The ability to actually stand up in a tent and have room to spare while moving around inside is amazing. I can set up my sleeping system (two sleeping pads, memory foam, double sleeping pad) with the dog bed at the feet and still have about a foot of room before hitting the tent wall. This only leaves us with about 45 extra square feet of floor space, which covers two crashpads stacked on each other as a seat and all the extra gear that I could possibly want within the tent, without coming anywhere near encroaching on the total space. The only possible detraction I’ve found with the size is that it is almost too big for some established campsite areas – if there is a raised wooden square to set your tent on, the entire square ends up within the footprint of the tent and the stakes must be placed well outside of it. The large rainfly/vestibule is the other great aspect of this tent. When totally set up, it creates a covered space that is also large enough to stand in, and it’s possible to set up a small kitchen within the vestibule to prepare food during inclement weather (it adds about another 40 square feet to the total footprint). It also serves as a good “staging” area where I can leave climbing gear without cluttering up the tent. The rainfly has kept the inside of the tent dry on a few occasions now, including two torrential downpours. I’ve used this tent for climbing in Shelf Road, Yosemite, and Maple Canyon so far this summer. 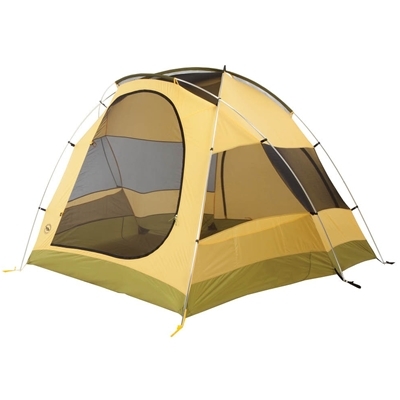 The set-up is surprisingly simple for a tent this large, and with two people, the tent and rainfly/vestibule goes up in a few minutes. It’s possible to construct the tent solo, though it is a little more difficult due to the size of the tent. Taking it down is casual and can easily be managed by one person; I can personally flip the entire tent over and keep it balanced to shake out all the dirt and such that always ends up making it into the tent. All in all, if you are looking for the ideal car-camping set up, the Big Agnes Tensleep 6 deserves your attention. It goes up fast enough that even if you are only out for a few days, it’s worth bringing along the giant. And if you plan an extended stay at any given area, it’s as close as you’ll get to having a studio apartment in a campground. Classy. Mike Kimmel is an Outdoor Prolink gear reviewer.